Charleston is a city with a lot of problems facing it, and one of the most pressing today is the huge influx of transient politicians from other areas of the state. I’m not talking about our normal local politicians. While it’s sad to see them around, they seem relatively harmless, and some of them are colorful personalities that can be amusing and even charming, in their own way. I’m talking about a new breed of politicians that have poured into Charleston in recent weeks and are likely to stick around for the next few months making things unpleasant and intolerable for all of us. 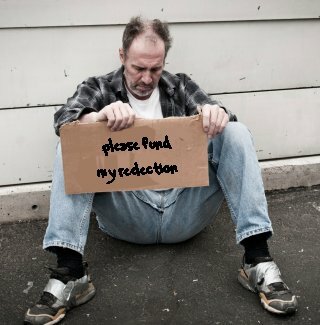 It’s become a safety issue as the politicians hit the streets begging for money. It used to be that they’d be happy standing by the street begging, which was unsafe, but not horrible. Now we have a more beligerent political fundraiser who might storm right up to you demanding a contribution, and if you turn them down they get agitated and start waving their arms and scream about “Obama’s war on coal,” and “Benghazi.” It’s made it so that I don’t really like going to some parts of Charleston anymore. You never know when some shady-looking person is going to come up to you and demand that you donate to their PAC. Part of the reason for this is that Charleston is such a compassionate city. 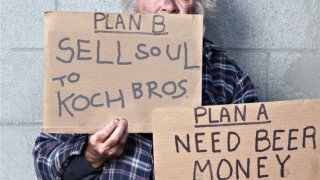 We have so many social programs to help support politicians. 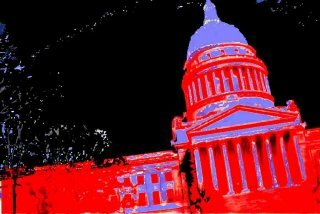 If a politician is willing to play by the rules, they can usually get warm meals at the Chop House or Soho’s, provided by the many good Christian lobbying organizations in town. If a politician doesn’t want to play by the rules and insists on getting drunk or hanging out with prostitutes, many of these groups will take care of their needs anyway. And that compassion has had the unintended effect of drawing even more politicians to Charleston. Our generous Per Diem program allows them to build massive tent cities in the Marriott and Embassy Suites downtown, and when the politicians are too lazy to feed themselves, you can be sure that lobbying groups will deliver Tudor’s Biscuits to the State Capitol and spoon-feed them a hearty artery-clogging breakfast. This has made Charleston a dumping ground for politicians. There are even reports that failed politicians from other states like Maryland and Maine were put on a bus with one-way tickets to Charleston when they became too unruly to get elected in their home states. It’s become a real problem. West Virginia is blessed with an architectural wonder in the Cass Gilbert-designed Capitol Building, but ask anyone in town, and they’ll tell you that they’ll do anything to avoid going there right now. The reason? All the politicians. They take over the place, like nasty Canada Geese in an otherwise peaceful pond, fouling it with their presence and wretched honking, and claiming all the best parking spots. 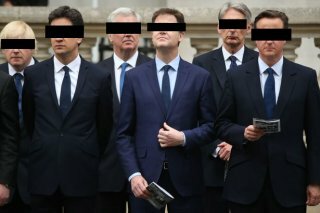 Of course, the real problem is that these politicians are generally up to no good. 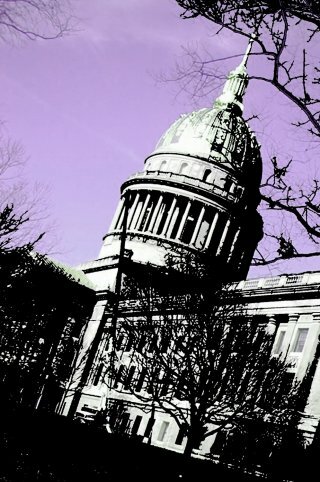 While in town they try to craft laws that are criminally harmful to the people of West Virginia. They’ll erase laws that protect our water, our air, our job safety, and they’ll try to kill off state agencies that they don’t like by slashing funding for education, public broadcasting, environmental protection and social programs. At the same time they’ll cut taxes on businesses that they, or their family members own, and try to make it impossible for anyone to sue a negligent business. This problem is very real and I really don’t know what we can do about it. Charleston’s poor lobbying organizations are overwhelmed, trying to keep this transient population of politicians comfortable with five-star meals, booze and other considerations, but the politicians are still out there doing their best to wreck this state. They’re not content with their salary, per diem and special license plates and parking privileges. They want more power, and they want it at the expense of average citizens. In an ideal world we wouldn’t have any politicians, but this is the real world and politicianness is a real and unavoidable problem. Charleston seems to have a worse situation than other cities because of the great number of support organizations in town. We can’t really avoid the elephant in the room either. The State Capitol seems like a magnet for these transient politicians, but every time we talk about moving it the social justice warriors start crying about how we’re targeting one particular segment of the population, so nothing gets done. What can we do? The good Christian thing to do when encountering a politician would be to offer them a meal, listen to them and actually engage them in conversation so that they feel like they’re worth something. After listening to them, gently explain that they’re wrong and have dedicated their life to furthering an evil agenda that will eventually lead to the destruction of this country. It’s highly unlikely, but they may actually listen to you and take your advice to heart and leave politics, perhaps returning to their home to find a job that actually contributes to society. Call me overly optimisitic, but I believe that many politicans can be rehabilitated and turned back into useful members of society. The difficult part is figuring out how to connect with them and explain how they can turn their lives around without completely robbing them of their dignity. We really need to find a way to deal with this issue, or Charleston will just become a shell of its former self. That is the PopCulteer for this week. For those of you who need to have your satire clearly labelled, this column was satire. Be sure to check back for all our regular PopCult features as we continue to post fresh content every day. 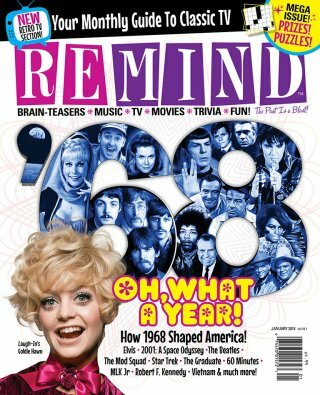 Remind Magazine Wallows In Nostalgia, And It’s Great Fun! Welcome to a new semi-regular feature in PopCult. Your PopCulteer has always been an avid reader of magazines, and in the past in PopCult I have made note of some of the periodicals that stood out on the stands. Now, in the spirit of PopCult always acting as a cheerleader for a downtrodden institution, every couple of weeks we plan to shine the PopCult spotlight on magazines that we think our readers might enjoy. Remind is actually in their tenth year of publication, and they’ve been on my radar for some time. I’d usually pick up an issue with a topic that interested me, and I enjoyed the nostalgia they present each month in a fun manner. Regular readers of this blog are probably all too aware of my fondness for pop culture nostalgia. However, with their latest issue, Remind has added a new feature that is so functional that it may well make the magazine a must-buy each month. 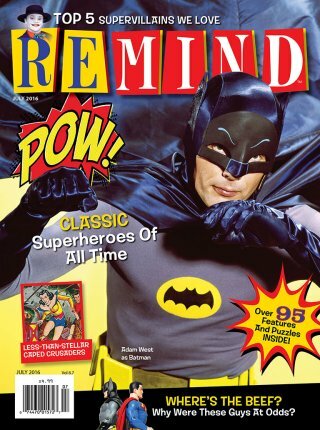 With the January, 2018 issue, Remind has added Retro-TV listings. They have a fairly comprehensive run-down of classic TV programs that run on cable and digital sub-channels, like ME TV, Antenna TV, Get TV and several that I hadn’t heard of previously. They also list a few classics that run on channels like Sundance and AMC. That’s not all. They also now run a two-page spread with the complete month’s programming guide for Turner Classic Movies. You may remember that TCM suspended the print version of their Now Playing magazine/guide last August, and switched to a wholly-unsatisfying digital format. With this new feature, Remind has picked up the slack and lets us Luddites enjoy flipping through paper to find out what movies are on TCM tonight, instead of getting an email that we don’t remember to open until half the month is over. This is a great and logical addition to the magazine and it’s not too much of a strain on the editorial staff. Remind‘s publisher, NTVB, also publishes TV Guide, TV Weekly and the Dish Network monthly guide, so they have all this information floating through their offices already. It makes perfect sense and it really enhances what was already a fun magazine. The key to Remind is pure nostalgia. They claim to cover each decade from the 1960s to the 1990s, but since nostalgia was already such a huge part of pop culture by then, they have also delved into pre-1960’s pop culture icons like the Universal Monsters, Elvis Presley, Marlon Brando, Humphrey Bogart, Marilyn Monroe and the earlier stars of Hollywood. I’m not complaining, because Remind employs a light, informed and fun approach to their articles. You won’t find deep, probing analysis here, just the highlights and some great photos. It’s fun, and that’s really something we need more of these days. The articles serve their purpose to remind us of the cool stuff from the history of pop culture. Hence the name. Remind also has trivia, crossword puzzles, word search, and one of my favorite features, reprints of vintage comic strips from the various decades. This is the kind of magazine that, by law, should be required in all waiting rooms. It’s a bit like Highlights Magazine for grown-ups. Another part of the charm of Remind is that it’s a hybrid magazine, with part of it printed on slick paper, and the rest on newprint. Hardly anybody prints on newsprint anymore, and to be honest, I sort of miss it. Too many modern magazines are all slickly printed (usually in Asia) on thick paper with art direction that sacrifices clarity for composition and content that reads like it was intended for a website. Remind isn’t like that. It’s a good, old-fashioned magazine on cheap paper that you won’t feel bad doing the puzzles in. When I was growing up there was a magazine called Good Old Days. This mag served much of the same purpose as Remind, only for an earlier generation as it was dedicated to the period from 1930 to 1960, and seemed more rural-oriented and less fun. Shockingly, Good Old Days is still being published, and still seems to not venture much beyond 1960 in it’s subject matter. So, good on them. It does seem like Remind skews a little heavily toward the 60s and 70s, but that doesn’t really bother me. 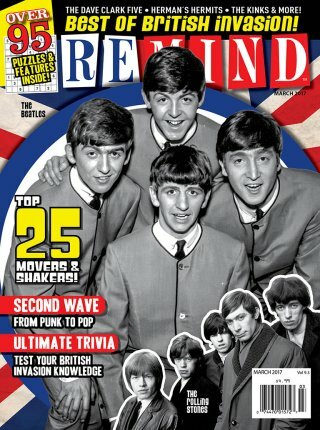 I can deal with a magazine that covers the Batman TV Show, Star Trek, Rowan and Martin’s Laugh-In and The Beatles. I don’t know if my younger readers will be that interested in this magazine, but the mag does touch on The Police, the early days of Apple Computers and Nirvana in their latest issue…even if the cover story is a look back at 1968. I admit that there is a chance that Millenials will look at Remind the way I looked at Good Old Days. One other nice note about Remind is that, except for the back cover, it’s ad-free. Given the age of the probable target audience, this is refreshing, because I’d really rather not be bombarded with ads for prescription drugs, trusses and catheters when I’m reading. The latest back-cover ad is for the Comet channel, which is pretty darned cool. If you are one of the dwindling number of magazine readers out there (and if so, why are reading a blog?) you might want to track down Remind. It’s five bucks and you can find it at many places that still sell magazines. Or you can subscribe at this link. New Shows Wednesday On The AIR! We have gotten ourselves back into a groove for the new year at The AIR , and Wednesdays always bring lots of great stuff to our humble little internet radio station. We continue our march into 2018 with brand-new episodes of our top programs. 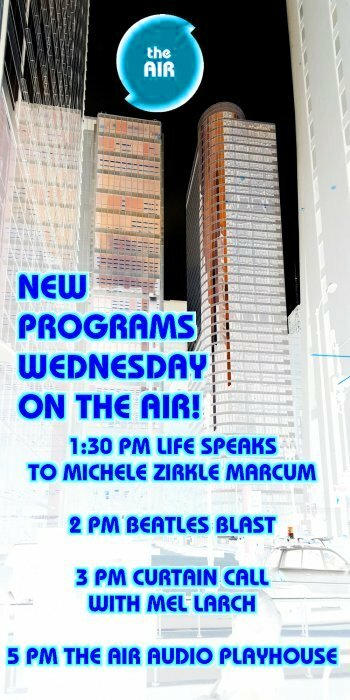 Today you’ll get fresh servings of Life Speaks to Michele Zirkle, Beatles Blast, Curtain Call and The AIR Audio Playhouse. At 11 AM it’s a special encore presentation of The AIR Audio Playhouse from last week, with once-thought-lost episodes of The Stan Freberg Show. Noon sees 90 minutes of Mrs. PopCulteer, Mel Larch, first hosting a replay of Curtain Call, and then also hosting a classic episode of On The Road with Mel. On The Road with Mel will be returning in a few weeks with new episodes in a slightly-tweaked format. At 1:30 PM it’s time for an all-new edition of Life Speaks to Michele Zirkle. This week we bring you part two of Michele’s intriguing interview with the paranormal investigators behind History and Haunts. This is a fascinating look into the world beyond the visible world with thought-provoking anecdotes and adventures. You can hear a replay of Life Speaks at 7 PM. Sunday night at 7 PM we will present both parts of this interview, back-to-back, as part of the Sunday night Talk Block. At 2 PM music takes over witha brand-new Beatles Blast, hosted by yours truly. This week it’s an audio collage of some of rare Beatles music that usually doesn’t make it to the airwaves. The show opens with “You Know My Name,” and after my introduction, it’s all music for the remainder of the program. Even the most die-hard Beatles fan will find something new and different. At 3 PM a brand-new Curtain Call presents a mix of the best examples of musical theater from the past, present and future, as Mel Larch throws in tunes from Grand Hotel, Marry Me A Little, South Pacific, Mamma Mia, and A Chorus Line, and previews songs from upcoming musical productions, Quadrophenia, Beaches and Frank Zappa’s Joe’s Garage. The AIR Audio Playhouse brings you an hour of Mystery at 5 PM, with a show that’s split between Alfred Hitchock’s Scary Tales For Young People and Mystery In The AIR. At 6 PM, our double-shot of The New Music Show and The (BS) Crazy Show follows that. Following a replay of today’s new episode of Life Speaks at 7 PM, we have a classic episode of Word Association with Lee & Rudy at 7:30 PM. 8 PM sees a replay of this week’s episode of Prognosis, as Herman Linte brings you the music of Premiani Forneria Marconi. At 10 PM we present two hours of our beloved Bat (poop) Crazy Show. At midnight, we don’t know for sure what will be on The AIR, but we’re leaning toward a line up of all-night comedy. The band has released the title track of their upcoming EP, Sometimes It Rains, as a teaser for their IndieGoGo Campaign to finish the record and get physical copies into stores. Creek Don’t Rise’s upcoming EP, “Sometimes It Rains,” will be released soon and includes all your favorite CDR songs. 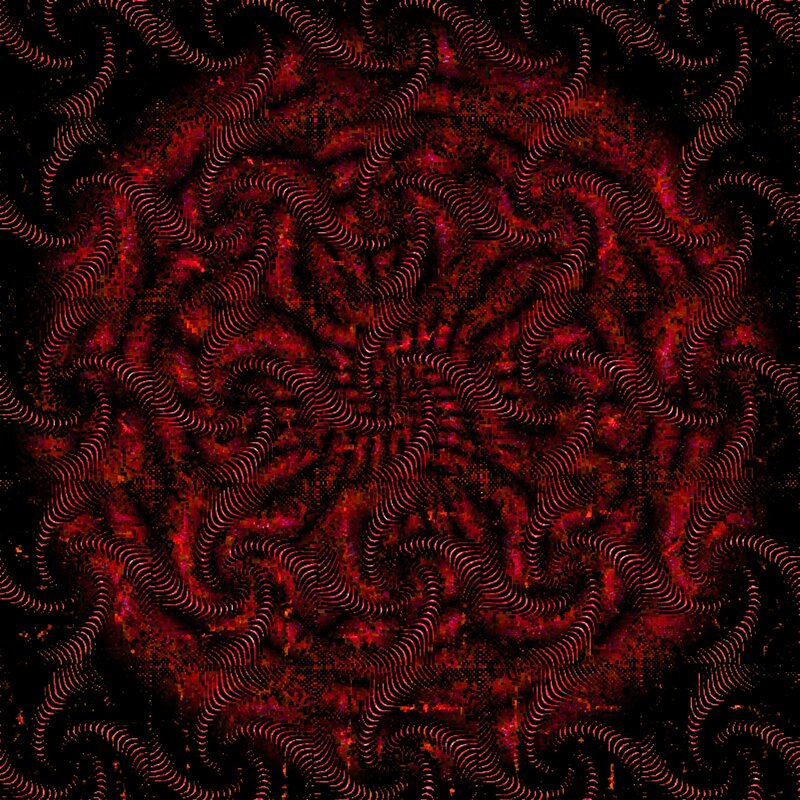 We’ve funded the majority of this record on our own but now we need your help. 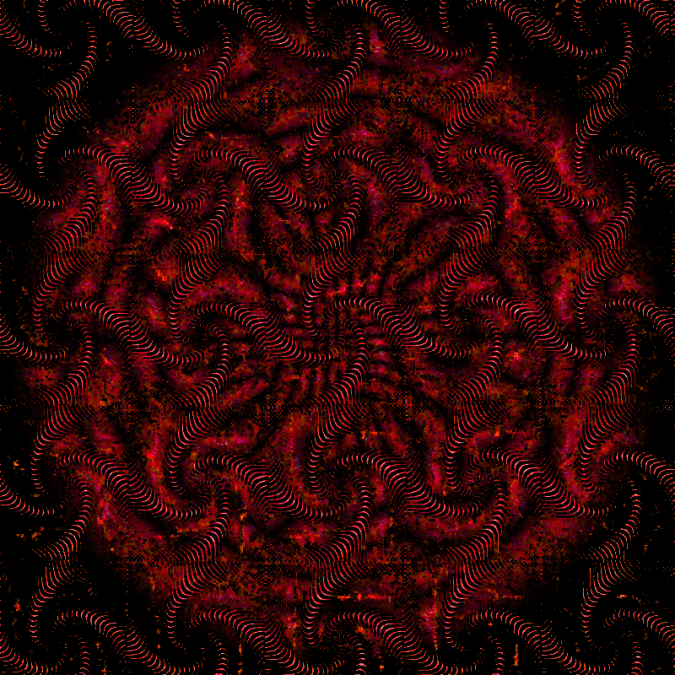 Contribute to this project and be one of the first to receive the new EP! These tracks have been recorded with Eddie Ashworth at the Oxide Shack in Athens, Ohio, and sound incredible. The band just needs some extra funds to get this project to the finish line. Funds raised will pay for the mixing/mastering of the EP, album artwork, distribution and new merchandise. “White Coat Man” is about the opioid crisis here in Appalachia as it relates to the over-prescribing of narcotics that lead to heroin addiction and often death. This song has meant so much to so many people. Folks come up to us after shows and tell us their stories about struggling with and overcoming addiction. We hope to shed light on an epidemic that is destroying our state and killing our friends. “White Coat Man” will be featured nationally on the PBS Newshour series “America Addicted” later this year as part of a series on the drug epidemic. Our demo version of this song has over 104k video views on Facebook. The song “Creek Don’t Rise” is about the desperation of watching everything you own be washed away in a flood; a feeling West Virginian’s know all too well. We’ve helped raise a lot of money for flood relief through this song. One testament to how meaningful this song is to folks is the demo version has over 248k video views. If you loved this song before, you’re going to be blown away with what we have done with it. Keep Up With The AIR for Prog, Local and Swing Music! Monday at 3 PM Herman Linte returns with the first new Prognosis of 2018. This episode is dedicated to the Italian Progressive Legends, PFM, who have just released a new album in both English language and Italian versions. In the second hour of Prognosis, Linte brings you the Italian language version of “Emotional Tattoos” by PFM. Tuesday at 10 AM and 10 PM, your PopCulteer hosts the local music showcase, Radio Free Charleston. This week’s show will feature new music from Creek Don’t Rise, Johnny Compton, John Radcliff and more, plus we’ll also dive into the vast RFC archives. 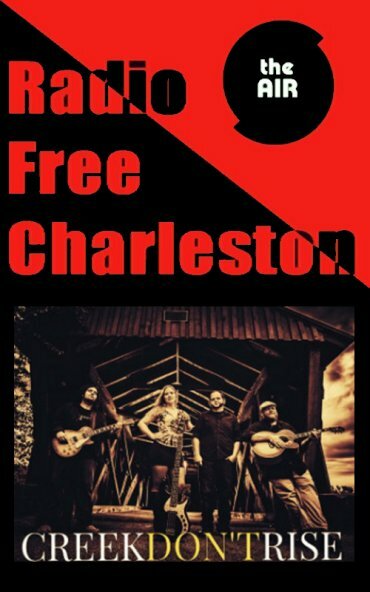 We always do our best to serve the local music scene here in Charleston, and Radio Free Charleston is the only radio show dedicated to all local music that has nearly thirty years under its belt. Tuesday at 3 PM stick around for a new edition of The Swing Shift, where your RFC hosts shifts gears and brings you the best Swing Music of the last century. This week’s show will mix Stan Kenton and Duke Ellington with Big Bad Voodoo Daddy, Brian Setzer Orchestra and Maureen and the Mercury 5, plus you can expect some new Swing Music from bands you haven’t heard of…yet. Above you see a geometric digital abstract called “Ball of Confusion.” It’s one of those things that was all generated by numbers. It could just as easily come out as an essay on Peruvian bees, with a simple misplaced digit, or if one of the punchcards was accidentally reversed as we fed it into the Univac. Click to see it bigger. Come back to PopCult later today for news on The AIR. We are expecting a new episode of Prognosis with Herman Linte, this week featuring the music of PFM, with their Italian-language version of their newest album making up the second half of the show, but we are still awaiting delivery. Sunday Evening Video: Live Madness! It’s concert time in Sunday Evening Video, as we take you to a recent show by a band that ruled the UK at the height of the Second Wave Ska movement in England. This is more than an hour of Madness at The House of Common, a show they put on to promote the release of their latest album, Can’t Touch Us Now, in late 2016. 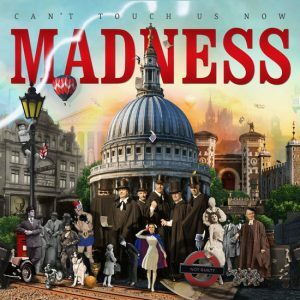 Madness are most famous here in the US for their giant hit, “Our House,” and had minor hits with a few more tunes, like their cover of “It Must Be Love.” The band spent a few years in the wilderness, but reformed in 1992 for live shows, and began releasing highly acclaimed new albums in 1996. Recent reunions have seen at least six of the seven original members of the band participating, with an open-door policy regarding members who step away for a while. Suggs remains the ever-present frontman. While the band are considered original Two-Tone Ska heroes, their music veered into more of a British rock sound, in the vein of prime-era Kinks, early on. They still remain a powerhouse band with a memorable sense of humor.Enjoy the show! 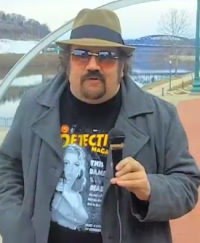 Episode 121 of Radio Free Charleston, “Thrilling Detective Shirt,” hails from February, 2011. This installment of RFC featured a double-dose of Beaver Knievel, a quick blast of folk/punk stomp from Dennis Hopper’s Army, plus vintage animation from Frank Panucci in addition to a visit from Robot Commando. Host segments were shot at Haddad Riverfront Park, and the show’s title shirt comes to us courtesy of Retro A Go Go. Before we jump into the show proper, just know this: Robot Commando wants to help you. He really does. We shot Beaver Knievel at The Blue Parrot, and this was one of the rare nights when we had the late Johnny Rock running camera, with Lee Harrah and yours truly on the other two. The band was a bit of a local supergroup, and has since seen some of its members return to their previous bands. Our other music guest was Dennis Hopper’s Army, performing their original “Used To Sing.” This is another group that’s not performing together anymore, but members of the band are still active in the local music and arts scence. Our animation is a film my brother produced as a child prodigy. Watch The Mugger and discover why his teachers trembled in fear. I’ve been writing PopCult for almost twelve and a half years now, and I try not to go back and dwell on past posts (largely because I hate to see how many typos I’ve missed along the way), but I also check my reader stats once in a while, and I noticed something a bit strange of late. One post that I wrote back in December, 2008, looking back on “50 Cool Things” that happened that year, has been getting a lot of hits lately. I mean, it’s getting a ridiculous number of hits for a post that’s over nine years old. Some days over the last couple of weeks it’s been read more than the new post that was published that day. My guess is that it’s just people searching for posts about 2018 and getting misdirected, but I have no real way of knowing why so many people were going back to read this one post. I decided to indulge my curiosity and went back to reread what I’d written about 2008, and a lot of it struck me as a bit remarkable (hence, these remarks). This post is a bit of a time capsule of how things were back in 2008, and it says a lot about how much things have changed and how much they’ve stayed the same. First of all, I was way more optimistic in 2008 than I am now. I think most of this has to do with the political climate. Back then we had just elected a dignified, honorable and competent man to lead our country. Now we don’t have one of those in charge. Charleston seemed to be in better shape back then. I gave shout outs to a lot of great businesses and organizations that are no longer with us. But also several that still persevere. IWA East Coast Wrestling is still a going concern, but they don’t run as many shows as they used to. All Star Wrestling is still bringing top-notch wrestling shows to Southern West Virginia. CYAC is still kicking, even with the future of their home theater in doubt. 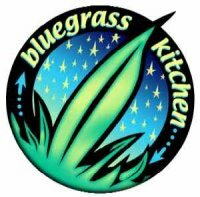 The Bluegrass Kitchen is still serving up high-quality eats on Charleston’s East End. Kanawha Players survived a near-fatal brush with owning real estate, and is steadily building back their legacy. The No Pants Players are mutating into “State 35” to keep supplying Charleston’s sketch comedy needs. Graziano’s is still the best pizza in town. Taylor Books and The Empty Glass maintain their positions as Charleston institutions. And Lady D is still performing and recently had a show at The Bakery. Brian Hatcher is still writing and John Nelson is still selling music at Budget Tapes and Records. We have lost a lot of cool stuff here in Charleston since I wrote that post. LiveMix Studio is no longer with us. Capitol Roasters, which I really liked, has been replaced by a beer and burrito place that has nothing I can eat or drink on their menu. WV Rockscene hasn’t been updated lately. The Book Exchange on the East End is not around anymore. The Vandalia Grille has gone under, and I have not yet tried its replacement establishment. 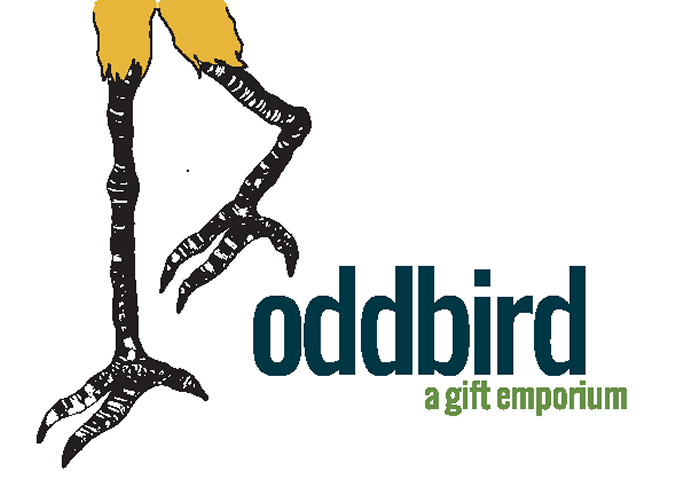 In their places we do have some pretty cool new places and things: Sullivan’s Records, Kin Ship Goods, Elk City Records, The Oddbird Emporium, Starling’s, Moxxee and all sorts of new places that I’m too lazy to remember to mention, or that haven’t opened yet. Life goes on. User fees go up. Local politicians continue to make poor decisions. The anti-Kanawha Boulevard forces even managed to win a major victory for Charleston’s seven bicyclists by reducing the Boulevard to two lanes near Patrick Street, creating one of the nastiest bottlenecks in the city during rush hour and forcing so many people onto I 64 that commute times out of the city have increased by twenty minutes to a half hour. Also, Shawnee Golf Course has been sacrificed for a multi-sports recreational facility that nobody local will use, and nobody in the region will want to visit. However, the smoking ban in bars, which took effect in 2008, is still going strong, and my lungs thank Kanawha County’s Health Department for that. The bar scene itself has been hit hard by the mass exodus of young drinking peoples and a few high-profile crimes, but now we can breathe when we have to record a band for Radio Free Charleston. At least they got that one right. I didn’t just talk about local stuff in this post, either. Pop culture had a lot going for it in 2008. Pixar was going strong. Love and Rockets had switched to their annual format (they switched back to more frequent publication in 2017). The Marvel Cinematic Universe grew out of the success of Iron Man, which I raved about. Everything didn’t click as well as I hoped. The Zeroids revival failed to make it past one comic book series, but Captain Action did manage a third run as a 12″ action figure, with more new stuff still in the pipeline. Aqua Teen Hunger Force finally ended, but Squidbillies continues and Adult Swim found new hit shows with Rick and Morty and Mike Tyson Mysteries. MEGA Bloks was bought up by Mattel and shut down their Pyrates and King Arthur lines. 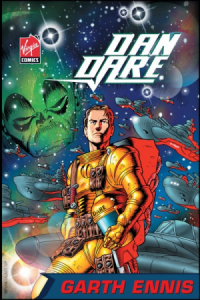 And Dan Dare fizzled out when Virgin Comics went belly-up and has been gone long enough that there’s yet another new revival of this classic British comic book being published now. Oh, and most of the local bands I mentioned by name broke up and a bunch of the musicians moved away. An alarming number of promising young musicians have left Charleston. However, the thing that hit me upside the head while I was re-reading this post was actually two seemingly unrelated items, which I now know have a heck of a lot to do with each other. I mentioned a benefit show for my friend, Emily Haynes. Emily had been diagnosed with Myasthenia Gravis, and it hit her really hard. Longtime readers of PopCult know that I was recently diagnosed with MG, but compared to Emily’s case, mine is a walk in the park. 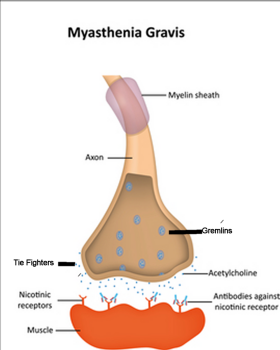 I have an extremely mild case of this disease, and I hope that sometime this year I can hook up with Emily for an interview so that I can share a more accurate portrayal of Myasthenia Gravis with my readers. 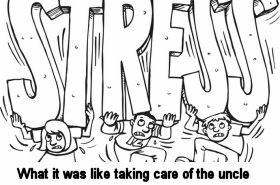 It was not a repetitive stress injury, like I thought. It was late Summer in 2008 when I discovered how weak my right hand had become. I went out to a bar in South Charleston to hear a band, and tried to shoot a game of pool for the first time in a long time. I discovered that I could not hold a pool cue well enough to make even one shot. I’d already adapted to periodic bouts of weakness in my hands, and learned to deal with occasional double vision, which I told people was probably related to diabetes (turns out it wasn’t). I’d managed work-arounds and was able to adapt and hide my issues from most people. This was when I was putting in 80 hours a week as a caregiver for my uncle, and there was no time or money to go to a doctor. It wasn’t until 2016 when I was finally diagnosed with Myasthenia Gravis, which I was already aware of only because of Emily. It never occured to me that I had the same disease as her, because, as I have explained, my case is so mild. I’m on meds for it now and I’m doing great, physically. But it was just really wild to find this contemporaneous mention of my hand problems buried in the same post where I discussed the benefit show for Emily. By the time I was diagnosed with MG, I had convinced myself that I was in the early stages of Lou Gerhig’s Disease, so finding out what was wrong was actually a great thing for me. Finding this mention from way back then was sort of an extra missing piece of the puzzle. However, aside from all that, which is very interesting to me, I still can’t figure out why so many people are going back to read that damned post. Friday sees a full schedule of new and encore programming. At 7 AM you can hear this week’s new episode of Radio Free Charleston International. 9 PM brings you encores of the latest editions of Word Association with Lee & Rudy and Life Speaks to Michele Zirkle. At 10 PM we present this week’s The Best of The Real with Mark Wolfe, which this week brings you a classic conversation with Chuck Hamsher of The Purple Moon. At 11 AM we bid adieu to Dexter Checkers as he takes Ska Madness on hiatus with a mini-marathon of skank. Ska fans will want to return at midnight for seven more hours of Ska Madness. 2 PM sees a new-to-The-AIR episode of Radio Coolsville with DJ Betty Rock. …all New Wave classics and all with extra-long 12″ dance mixes. Stick around in the evening for encores of Beatles Blast, Harrah’s Hard & Heavy and both RFC shows. 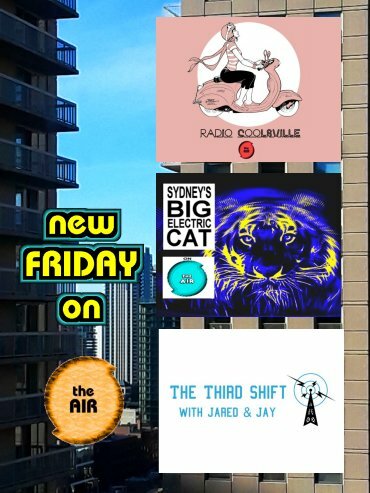 At 9 PM, in the midst of all this, you can tune in for a full hour of The Third Shift with Jay and Jarod. 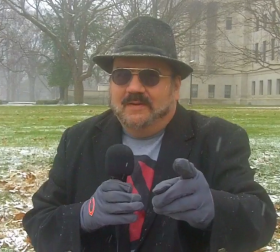 That’s what’s on The AIR Friday, and that is this week’s PopCulteer. Check back because we have a fresh post every day. This week lucky PopCult readers can partake in three different versions of my Charleston, West Virginia-based music program, Radio Free Charleston. Up above this text you can watch the latest video episode of the show. This is the first video RFC since early in 2016, and it was great to flex the video muscles once again to prove that I could still do it. After taking an extended hiatus to deal with some health issues that made editing video difficult, I have recovered sufficiently to return to producing my video Valentine to Charleston’s music scene on a limited basis, with four to eight episodes planned for 2018. You can read the full production notes and more about our future plans for the show HERE. But that’s just the first of our RFC trio this week. Thursday at 3 PM we bring you the final entry in our RFC trifecta with Radio Free Charleston International, the weekly, two-hour show where I play any music that I feel like playing. This week we open with unplugged Simple Minds, and progress through 120 minutes featuring soundtrack music from a Godzilla movie, classic tracks from Split Enz, The Ramones, Hawklords and The Who, and new tracks from Downes Braide Association, Cindy Wilson (from The B 52s), Charlotte Gainsbourg and many others. RFC International is a throwback to the original Radio Free Charleston radio program from 1989, which started out as a way to bring alternative and progressive music to Charleston radio listeners. We quickly added local music to the mix, and it was a real kick to mix the local stuff in with the best music from around the world. When we revived RFC as a video show in 2006, due to issues with music rights, we had to narrow our focus on local music, and for the next ten years or so that was the primary mission of Radio Free Charleston. Rather than bringing new music INTO Charleston, we focussed on bringing Charleston’s music to the world. Now that we have The AIR and can once again play whatever we want, we’re mixing things up while enjoying the best of both worlds. Plus we have several other great radio programs, because programming a radio station on your own 24 hours a day can get a bit tiring. Thursday at 10 PM we have a new-to-The-AIR episode of The Best of The Real with Mark Wolfe, where Mark talks with Chuck Hamsher of The Purple Moon. At 11 PM stick around for an hour of Stan Freberg on The Comedy Vault (this is a totally different hour of Freberg than we featured on yesterday’s episode of The AIR Audio Playhouse).